Because of Corey’s strict attention to the needs of every customer, you don’t have to adjust your needs to standard products – Corey can produce a product to fit your needs. As a result of a recent expansion of our small diameter grinding capacity we are now able to grind both brass and aluminum bars in addition to steel. Tolerances closer than those for cold drawn or turned bars can be achieved for size and concentricity through centerless grinding. Centerless grinding also results in a superior surface finish with Ra values much lower than those attainable by the drawing or turning operations. 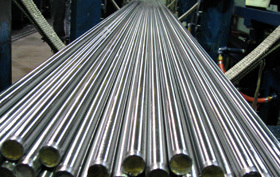 For more information about Corey Steel’s cold drawn ground & polished steel bars, please see Products > Ground & Polished.